Apple is rumored to be finalizing its supply chain plans for this year's anticipated iPhone update, with longtime partner Foxconn unsurprisingly expected to receive the bulk of orders for the new, larger "iPhone 6." Foxconn is expected to build both 4.7-inch and 5.5-inch varieties of the next iPhone, according to Taiwanese tech industry publication DigiTimes. Assembler Pegatron is also expected to pitch in, but will account for only 30 percent of the 4.7-inch model, and none of the 5.5-inch version, the report said, citing unnamed industry sources. The report also claimed that Apple's current 4-inch iPhone size will live on, but referred to it as an "existing" model, suggesting it may just utilize legacy hardware rather than sporting upgraded internal components. 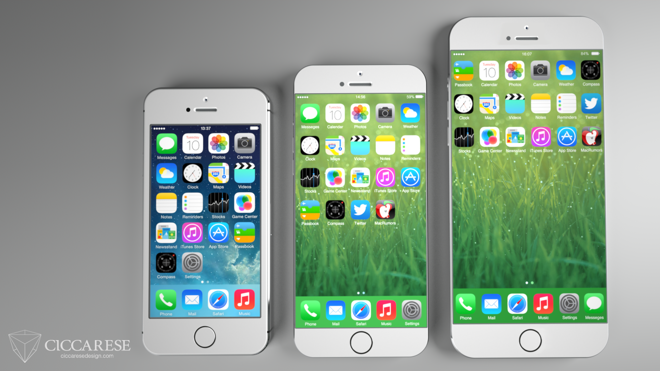 It was said that Wistron will handle orders for the 4-inch iPhone heading into 2015. Regardless, the 4-inch model is still apparently expected by supply chain sources to be a major part of Apple's smartphone lineup moving forward. Tuesday's report said that both the 4- and 4.7-inch models will be the "main sales force for Apple in 2014," suggesting that the jumbo-sized 5.5-inch model is expected to target a smaller segment of the market. Finally, it was said that Foxconn's plants in Zhengzhou, China, are expected to begin supplying the 4.7-inch model in July, while manufacturing of the 5.5-inch variant may begin in August. Rumors of late have been generally consistent about those two new screen sizes being in the works for Apple's 2014 iPhone update. Both handsets are expected to use Apple's next-generation "A8" system-on-chip with a gigabyte of RAM. Aside from larger screens and faster processors, the new iPhones are also expected to feature a thinner design, making them about as thick as Apple's current iPod touch lineup. And it's also been claimed that the lock/wake button on the device will be moved to the upper right side of the handset, potentially making it more easily accessible for one-handed use.